Two Grey Hills Navajo Indian Rugs are known as weavings in which no colored dyes were used. Instead, weavers carefully combed and spun different natural colors of yarn to yield a beautiful range of creamy whites, tans, browns, and greys. (To get a solid black color, weavers sometimes would over-dye dark brown wool with black dye.) The weavers around Two Grey Hills developed very complex geometric patterns, usually based on a large, hooked, central diamond with multiple geometric borders. 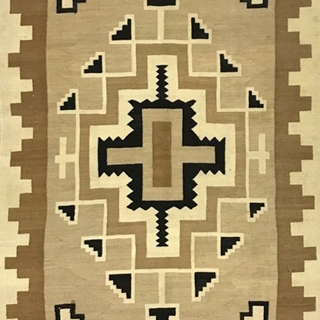 They also were known for very finely spun wool of small diameter which they used to make very thin, dense, and tightly woven rugs that are certainly the greatest technical achievements in the history of Navajo rug making. Many of the women who now weave for nearby Toadlena Trading Post carry on this tradition of quality. The most finely woven rugs often are called tapestry rugs. Medicine Man Gallery specializes in old navajo indian rugs from Two Grey Hills, including rugs by master weavers such as Daisy Tauglechee. Cassandra Paul - Navajo Two Grey Hills Rug, c. 1980-90, 61" x 41"
Clara Washburn Vaughn - Navajo Two Grey Hills Rug, 66" x 37"
Daisy Taugelchee - Navajo Two Grey Hills Rug c. 1977, 28.25" x 15.25"
Esther Etcitty - Navajo Two Grey Hills "Kokopelli Flute Player" Pictorial Rug with Yei Dancers, Turtles, Rain Cloud, and Animal Motifs, 45" x 58"
Esther Etcitty - Navajo Two Grey Hills Rug with Kokopelli Figures, 40" x 58"
Esther Etcitty - Navajo Two Grey Hills Rug with Kokopelli Figures, 46" x 54"
Faith Smith - Navajo Two Grey Hills Storm Pattern Rug, 44" x 29"
Isabel Yazzie - Navajo Two Grey Hills Rug, 47" x 30"
Larry Nathaniel - Navajo Two Grey Hills Rug c. 2008, 32" x 21"
Lorraine Taylor - Navajo Two Grey Hills Rug, 47" x 28"
Marie Lee - Navajo Rug Two Grey Hills Rug c. 2012, 27" x 17"
Mary H. Yazzie - Navajo Two Grey Hills Night Skies Pictorial Round Rug, 42" x 42"
Mary Jumbo - Navajo Two Grey Hills Rug, c. 1990, 43" x 32"
Mary Yanabah Curley, Bear Clan - Navajo Two Grey Hills Rug with Whirling Logs c. 1930, 74" x 48"
Navajo Two Grey Hills Large Floor Rug, c. 1930, 127" x 74"
Navajo Two Grey Hills Large Rug, c. 1930, 145" x 78"
Navajo Two Grey Hills Pictorial Rug with Dalutso (Dragonfly) Figures, c. 1920, 85" x 39"
Navajo Two Grey Hills Rug by Calandra Henderson, 36" x 25"
Navajo Two Grey Hills Rug by Frieda Fulton, 41" x 32"
Navajo Two Grey Hills Rug by Mary Joe Gould, c. 1974, 54.5" x 34.75"
Navajo Two Grey Hills Rug by Mary L. Begay, 22" x 31"
Navajo Two Grey Hills Rug by Rita Manygoats, 27" x 20"
Navajo Two Grey Hills Rug by Samantha Deal, 46" x 26"
Navajo Two Grey Hills Rug c. 1920s, 58" x 40"
Navajo Two Grey Hills Rug c. 1930s, 54.5" x 35"
Navajo Two Grey Hills Rug c. 1940, 48" x 34"
Navajo Two Grey Hills Rug c. 1940, 67.5" x 47"
Navajo Two Grey Hills Rug c. 1960s, 54" x 33"
Navajo Two Grey Hills Rug c. 1969, 65.5" x 37.5"
Navajo Two Grey Hills Rug, c. 1930, 48.5" x 82.5"
Navajo Two Grey Hills Rug, c. 1930-40, 72" x 55"
Navajo Two Grey Hills Rug, c. 1940-50, 100" x 82"
Navajo Two Grey Hills Rug, c. 1958, 76.5" x 49"
Navajo Two Grey Hills Rug, c. 1960-70, 80" x 55"
Navajo Two Grey Hills Rug, c. 1970, 65.5" x 51.5"
Navajo Two Grey Hills Rug, c. 1970, 74.5" x 55"
Navajo Two Grey Hills Rug, c. 1980s, 23" x 33"
Navajo Two Grey Hills Rug, c. 1989, 43" x 34"
Navajo Two Grey Hills Rug, c. 1990, 35.25" x 24.25"
Navajo Two Grey Hills Rug, c. 1990, 50.5" x 43.5"
Navajo Two Grey Hills Rug, circa 1930, 141" x 72"
Navajo Two Grey Hills Saddle Blanket by Sandie Tsosie, c. 2000, 45.5" x 30.75"